Acne is a condition in which the skin pores are clogged causing inflamed pus pockets. Possible causes of the occurrence of acne is due to hormonal changes that stimulate oil glands in the skin tissue. 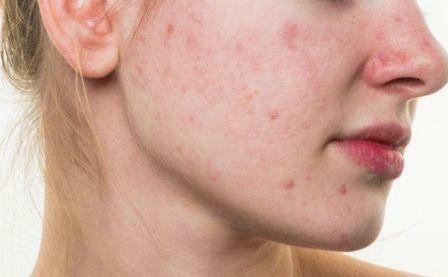 In addition to hormonal changes acne can also arise as a result of menstruation, stress, pregnancy, drug consumption, or also because of poorly groomed skin. Acne in general often appears on the skin area of ​​the face, neck and back. "There is not a single person in the world who goes through his lifetime without a pimple on his skin"
Acne is very annoying especially for you women, acne that appears on the face will be very disturbing your appearance, therefore acne should be treated immediately. If acne appears on the face do not you eager to squeeze the pimple, because it will only damage the skin and make acne worse. Therefore we must be extra careful in handling this acne, if one step is not impossible to trigger more acne on your face. How to Remove Acne ? There are many ways to get rid of acne on the face, one of them is by using facial cleanser products manufactured by the factory and sold in the market. Rinse face first with warm water till clean, dry slowly and do not rub too hard. Slice thin lemon then apply to your face, especially wear in the acne. Maybe a little bit sore, but just hold it because it means the acid is reacting and treating acne. Let stand for approximately 15 minutes, then rinse with cold water, so that the face feels fresh. Do it every day if necessary as a treatment on your acne, and every 2 days as a skin care to prevent your face from acne disorders. Phytonutrient compounds found in avocados, such as polyphenols and flavonoids have been found to have anti-inflammatory properties, thereby reducing the risk of inflammatory and degenerative disorders. Avocado is also rich in antioxidants, avocados are very useful in fighting the symptoms of aging. Glutathione in avocados can boost the immune system, slow the aging process, and promote a healthy nervous system. Avocado oil is often added in many cosmetics because of its ability to nourish the skin and make your skin glow. It also helps in treating psoriasis, a skin disease that causes skin irritation and redness. Peel and cut the avocado into small pieces, then puree until soft, clean the face first with water and dry with a towel. After that apply the dough to the face of the avocado as a mask, let stand for 15 minutes. Clean and rinse the face with regular water. Wash your face first with warm water (not too hot), then dry it gently using a towel (just in the paste-only). Cut the apple and stick it evenly on the face, especially on the acne facial skin. Let stand for 10 minutes, then wipe with warm water. Repeat the way, shake the apple as a mask on the face and let stand for 15 minutes, then wash the face again with cold water, and wipe with a dry towel. The first step is to absorb excess oil on your face first, then the second step to include apple vitamins into the skin and treat acne. Perform a daily routine for acne treatment and every other day for acne prevention and facial skin care. Clean face first with warm water and wipe with a towel to dry. Paste a thin slice of cucumber evenly throughout the surface of the face until covered flat. Let stand for 30 minutes, then rinse face with cold water until clean and dry. Do it as often as possible, cucumber has a relaxing and refreshing effect on your facial skin. Another way to use cucumber as skin care is to make grated cucumber, then paste evenly over the surface of the facial skin. In addition to drink, coffee can also be used as an acne medicine. Yes by using it as a coffee mask, this way is powerful enough to remove acne and also remove the scars from acne. Before applying a coffee mask, you should clean your face in the same way you normally do. After that mix the coffee powder with a little water so we easily apply it on the face. Coffee mask is applied to the face and do not forget while massaged-massage slowly. Let stand for approximately 30 minutes and wash with cold water then handuki slowly. Coffee mask works to remove acne and black stains acne scars, but it turns out that coffee masks can make the face also brighter shine. First of all you must choose carrots with good quality, grate the carrot until smooth. Clean your face first with warm water, then stick to face and let stand for 15-20 minutes, wash face with cold water until clean. This mask works in addition to eliminating acne can also make the face becomes naturally bright and radiant. Eliminate acne with bengkoang mask is very easy way, clean the face first with clean warm water, so that the skin pores open / widened. After that take one bengkoang and grated or blend with a blender, no need to add water, because bengkoang already contain enough water. After that flatten to face and let stand for 30 minutes, then wash face with cold water so that pore closed again. Perform this treatment every afternoon so that acne on your face can gradually disappear. By using natural ingredients will certainly reduce the negative effects that will occur on the face when compared with using chemicals or drugs that must have some negative effects for those who consume them. Now your face will be free from acne, bright shine nature and back confidence because your face already looks beautiful without acne.